What’s it all about? I think you all know by now. This is Call of Duty, the world’s biggest, brashest and noisiest video game. Only this time it’s in the future. And has Kevin Spacey in it. It’s 2058 and private military corporations are now the most powerful forces in the world. Spacey plays Jonathan Irons, the CEO of the world’s largest PMC ‘Atlas’, who has started a war against America to shift the balance of global power. America fights back, of course, and everyone has a good old dust up with high tech guns, jump suits and walloping great big laser-firing tanks. Ooh-rah. How does it look? It looks like Call of Duty. Only in the future. The behind closed doors demo at E3 featured two sections of the game, the first of which was set on San Francisco’s Golden Gate bridge and was named ‘Collapse’. Guess what happens at the end? We are a Tier One operator of the Sentinel group, chasing some bad guys through the streets of San Francisco in a car mounted with a rail gun. It’s frenetic stuff, weaving through traffic, roads crumpling, the gun firing fizzing bolts of blue electricity with a ferocious crack. The car crashes and now we’re on foot, picking off bad guys with an assault rifle. Familiar enough stuff. But there are some neat quirks to the CoD formula that make Advanced Warfare an interesting proposition. Chief of which is the exoskeleton that your soldier wears, allowing him to double jump and leap atop upended vehicles or hard to reach vantage points and brings a pep and verticality to the movement that Call of Duty has never really had. There’s a whiff of Titanfall’s kinetic energy, without the all out wall-running and parkour. Other futuristic equipment looks fun to use. You carry hybrid grenades, the purpose of which can be changed by flicking a switch. Frag and flash are self-explanatory, but there is also the smart grenade, which flutters in the air for a brief moment before homing in on an enemy, you can also use the ‘threat’ grenade to locate enemies hiding behind cover. As we’re fighting along the bridge, we rip a car door off its mountings to use as a shield, with the suggestion of environmental manipulation and a lot more natural damage to the levels. Civilians come streaming between cars, yelling and panicking as the PMC soldiers fire wildly behind them. A van releases a squadron of flying drones who attach themselves to the suspension cables of the bridge. They all explode in a fearsome whumph, severing each suspension cable and sending the bridge into a twisted spiral, concrete cracking, cars and men slipping down the crumpling asphalt and into the drink below. Call of Duty certainly hasn’t lost its touch for the dramatic. And to be fair, it looks and sounds spectacular on the new-gen, the kind of action set-piece that only the most expensive of movie blockbusters attempt. The second section of the demo took a slightly quieter tack, two operatives sprinting through a Bulgarian forest, initially being hunted by a helicopter spotlight before finding shelter under the trees. Then it’s on to full stealth mode, with you able to cloak yourself using a wrist-mounted gadget. You seem entirely invisible to the naked eye, allowing you to sneak up on people and bash their head into a tree. The enemy has a ‘seeker’ beam, however, which can see right through your cloak if it lands on you. After infiltrating a hidden base, blowing it up, you then steal a tank. Which lets you blow more stuff up, in case you hadn’t had enough. Watching the tank roll through the forest, constantly letting off rounds with a deafening thud, thud, thud, the bombardment fatigue sets in. There are some nifty gadgets and sensational views, but there’s no getting away from the fact this is seems to still be a Call of Duty game, with lots of following the leader and bombastic linearity. There’s nothing wrong with that, though you would want the market leader to be pushing the boundaries of new-gen on more than its looks. The futuristic gadgets look to be the game’s strong point and it will be interesting to see if they are expanded upon further in the final game. Anything else? I didn’t see Kevin Spacey once in the demo. Shame. When is it out? 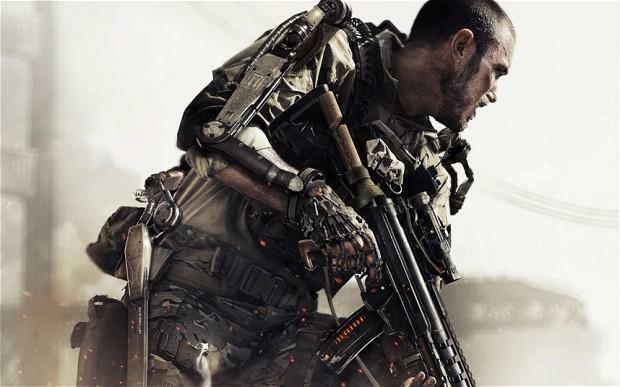 Call of Duty Advanced Warfare will be released for Xbox One, PlayStation 4 and PC on 4 November.